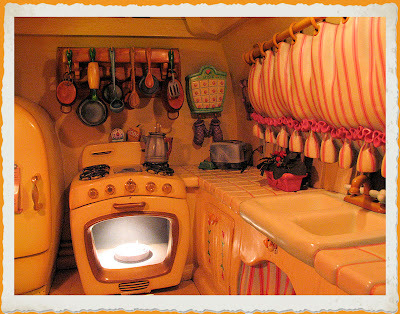 I LOVE Minnie Mouses' house in ToonTown at Disneyland! I want to move it to a bluff overlooking the ocean! (be sure to click on the photos to enjoy the details, some are as tiny as a mouse...har-har). I adore your new decor! simply stunning and over-the-top fabulous. especially the oven with a little cake inside. is that for me? mary ann: you may not believe this - but I thought of you at Moss Cottage when I stepped inside here...I swear! 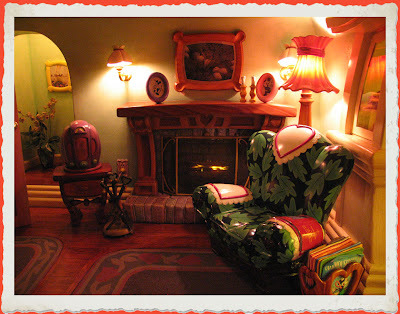 marita: I REALLY wish my livingroom looked as cozy as Minnie's! LOL! The chairs are a little too hard for me, thank you very much!! I LOVE your journal!! Where did you get the Excess Moisture stamp!?!?!?! Oh I love it! I am a HUGE Disney fan! Can I move in? Close Out Sale @ AlteredInsomnia!